Catalign Quarterly is an attempt to put together insights relevant for fostering a culture of innovation in organizations. This is the second issue of the Quarterly. Theme for this Quarterly is “Intuition & innovation”. There are five articles in this issue. The first article is a book review of what I believe is a landmark book on the theme of this issue. It is written by Nobel Laureate psychologist Daniel Kahneman. The second article is on the legendary mathematician Srinivas Ramanujan and marvels & flaws of his intuition. The third article explores the relationship between creativity and intuition as discussed by Kahneman. 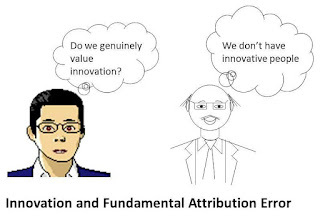 The fourth article explores a classic bias called fundamental attribution error through the question "Is poor idea flow a people issue or situation issue?" Finally, the fifth article looks at the metaphor of weighing scale as a type of measure and its relationship with culture change. Hope you find some of the articles helpful. 3. 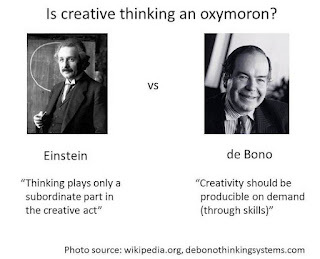 Is creative thinking an oxymoron? Next quarterly will be based on the theme: Design of strategy as if implementation matter. Imagine you are looking at the flow of ideas coming into your idea portal. You see the rate of ideas languishing for the past several months. What will you conclude? Will you, for example, feel that the employees don’t know how to think creatively and need some kind of training on tools / techniques for generating ideas? In case you feel this way, you may be committing what psychologists call fundamental attribution error. It is a deep-rooted inclination to attribute people’s behaviour to the way they are rather than the situation they are in. In this article, let’s explore how lack of ideas could potentially be a situation problem. A few months ago I facilitated an idea generation session for a corporate finance team. The expectations weren’t high. 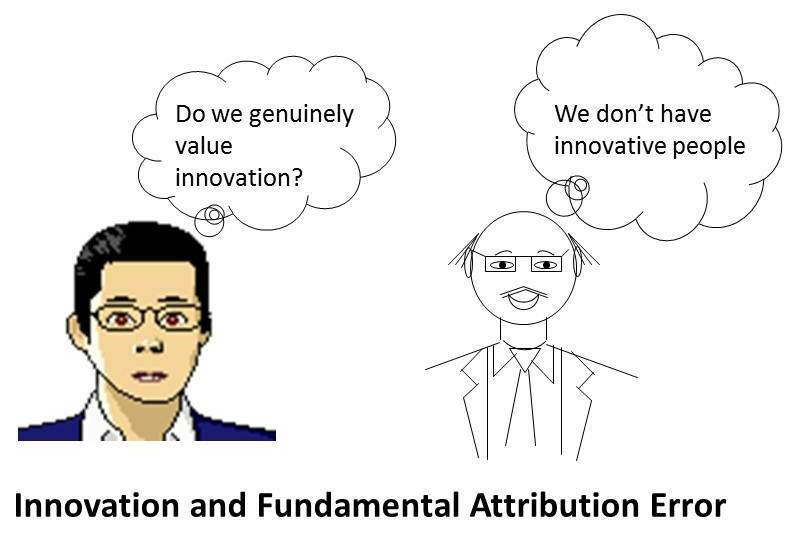 Traditionally finance folks are the low scorers on the innovation activity. We thought of first gathering “top of the hat” ideas and then after 10-15 minutes when we begin to get long silence breaks, prompt with some leading questions. The session began with the manager highlighting the importance of small ideas and how when added up they can cumulatively create a large impact. It was pointed out that one of the participants has submitted an idea in the past and was recognized by the organization. And then the idea generation session began. And to my surprise, it continued uninterrupted for the next hour when 53 ideas were gathered. Many ideas were built on top of each other’s ideas. At the end, every participant among the 18 had given at least one idea. What happened here? Did the participants become more creative? Did they learn any tool? No. What happened was that a space & time was created where idea generation was the primary focus. There were no other distractions. People were told by their manager that small ideas are welcome. And in this case people believed him. What changed was the situation not the people. Unresponsive: The system could be slow in responding to submitted ideas. For example, it might be several months before you receive any response. You lose faith. Lack of transparency: Similar to Roger Smith’s experience you might get a “not selected” response with no further explanation. You don’t even know if there is a well-defined criterion and if so, it is being used. Conflicting message: On the one hand, the campaigns may be saying that small ideas are welcome. One the other hand, top management rewards / mentions only BIG ideas. You doubt whether you have any BIG idea. There are several ways to tackle these specific issues. Scott Cook of Intuit talks about how an environment of experimentation shifts the decision making related to idea selection from politics and power point to validation through low-cost high-speed experiments. This reduces the burden on the idea selectors and improves responsiveness. Similarly, organizations use social networking features – peers commenting, doing “like” on ideas to improve both transparency and speed of idea movement. This does not mean that tools / techniques for idea generation are unimportant. In the organizational innovation ecosystem I identified learning & development as one of the five key dimensions. Besides, training programs also tackle the situation problem by bringing the people out of their cubicle and creating a space conducive for idea generation – irrespective of the tool / technique. The point is that we sometimes view training programs as the primary lever for improving innovativeness and ignore the other dimensions. Next time when you label something as a people problem, ask yourself, "Am I committing the fundamental attribution error?" Is creative thinking an oxymoron? Eckhart Tolle quotes Einstein in his bestseller “The power of now” that goes – “Thinking plays only a subordinate part in the brief decisive phase of the creative act itself”. And then Tolle writes further, “So I would say that the simple reason why the majority of scientists are not creative is not because they don’t know how to think but because they don’t know how to stop thinking!” Contrast this with Edward de Bono, famous for his work on lateral thinking. De Bono is the proponent of creativity as a learnable skill and his thinking tools are part of school curriculum in over twenty countries. 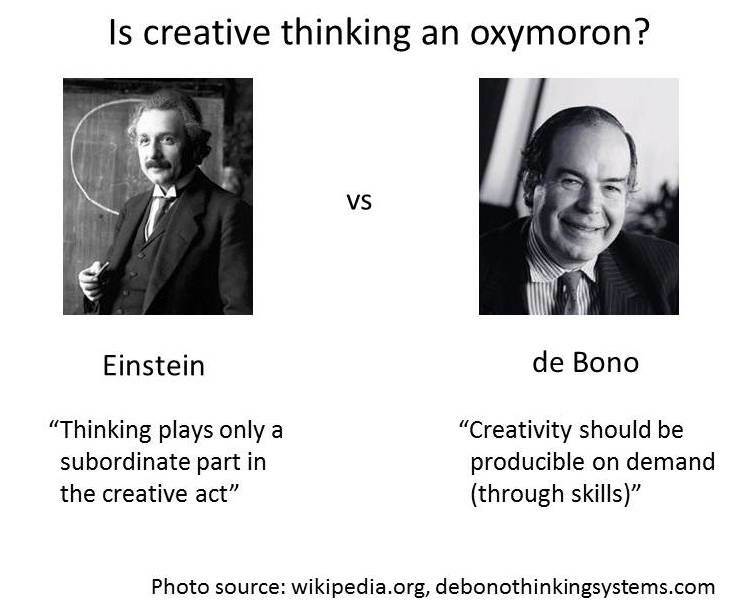 de Bono says, “Creativity should be producible on demand. Formation and design of new ideas can’t merely be left to chance.” Is creative thinking a skill that can be learnt like de Bono says or is thinking a hindrance to creativity as Tolle says? Let’s explore. Andrew’s version of the moment of insight looks closer to what Tolle & Einstein are saying. In particular, Andrew is saying that there comes a time when one type of thinking (he calls it routine kind of thinking) stops and another type of thinking (he calls subconscious thinking) takes over. Daniel Kahneman calls the former – slow mode of thinking or system-2 thinking or rule governed thinking. And the latter – fast mode of thinking or system-1 thinking or intuitive thinking. Kahneman advocates following definition of creativity attributed to Sarnoff Mednick: Creativity is associative memory that works exceptionally well. Mednick’s definition of creativity connects both Tolle and de Bono. When Tolle says that thinking should stop, I feel he means that the interference due to the slow mode of thinking (system-2 or rule governed) should stop and let the intuitive thinking take over. Similarly, de Bono’s six thinking hats technique is trying to help you reach out to those areas of your associative network that you will not go to in the normal course. In short, whether creative thinking is an oxymoron would depend upon the type of thinking involved. I was invited at an IT services company in Bangalore to give a talk on technical leadership last Friday. During the talk as well as in the Q&A session several questions were raised. I realized that there is a need for a platform where engineers transitioning from being a technical expert to becoming a technical leader can turn to for raising doubts, discussion and guidance. I also realized that there are several people out there, some of whom I know personally, who are in a better position to answer the questions than me. With this background, here is an attempt to create an FAQ forum for questions related to technical leadership. To get started let me use following definition of a technical leader - we can always question the definition later. A technical leader is someone whose sphere of influence due to his technical expertise is significantly greater than his span of control. As per this definition, engineers on the technical ladder (Product / Solution Architects, Principal / Chief Engineers, Technology Consultants, Scientists) are technical leaders. Moreover, managers who are able to influence people beyond their team with their technical expertise are also technical leaders. Please give your views by clicking on any specific question and then adding your comment. You can also raise a new question. 1. In IT services companies, one needs to move from project to project - each lasting only a few years. How does one balance breadth vs depth? 2. I like to work alone and not worry about other peoples’ salary / leave etc. Does it mean I should opt for technical career path? 3. I am a Java person with 6 years of experience. What can I expect to be doing 4 years from now? Where do I begin? 4. Will the IT industry in India need more managers or more technical leaders in future? 5. Technology such as .Net or Java changes very fast. How do I cope up?